We now know and can appreciate the threat of hurricanes. Not that we did not appreciate the reality of hurricanes–of course we did–but Hurricane Harvey and Hurricane Irma created the type of actual devastation we fear because they hit close to home. The fear came to life, creating panic, anxiety, and uncertainty. It is hard to plan for a force majeure event such as a hurricane because of the capriciousness of Mother Nature. But, we need to do so from this point forward. No exception! And, I mean no exception!! A force majeure event is an uncontrollable event that cannot be anticipated with any degree of definitiveness. 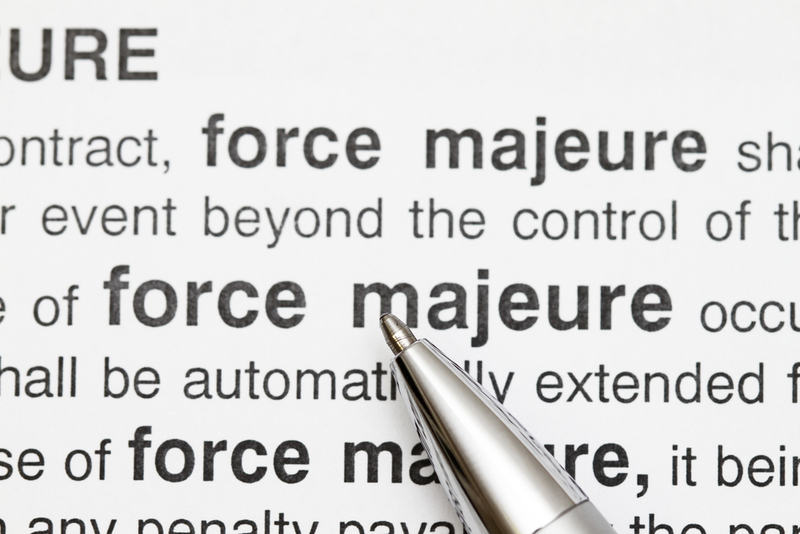 The force majeure event will excusably delay or hinder performance obligations under a contract. One type of force majeure event is a hurricane—an uncontrollable and unforeseen act of Mother Nature. Standard construction contracts will contain some type of force majeure language. The language will entitle the contractor to an extension of time to perform since the force majeure event will have excusably delayed the contractor’s performance. I am not going to rehash that standard language because this language needs to be modified and tailored to address the major risk of a hurricane. Not only is time impacted, but money is impacted too. We need to consider the total impact of a hurricane versus considering the impact in isolation or in a vacuum. Take a look at your present construction contracts. Revisit the force majeure language. Does this language adequately address the time and monetary impacts associated with a hurricane? If it does, great! If it does not, or can be written much better, now is the time to make this language a MUST-INCLUDED provision in your construction contracts because this risk is real. It is not illusory and it will be a real risk during hurricane season. If you do not know or are unsure as to the language, please engage a construction attorney to review your contracts or propose standard language for you catered to your business needs. Even if you feel comfortable with the language, I would still encourage you to have a construction attorney review the language and provide constructive feedback on the language. At this point, there is no excuse to neglect this risk or minimize the potential of a devastating time and cost impact. Regardless of the type of construction work you perform, this risk needs to be addressed. Any owner should appreciate this risk because it is a reasonable risk that needs to be accounted for with certainty in your construction contract. Is this a risk you completely want to assume from a cost standpoint? 1) Make sure there is builder’s risk insurance covering property damage during construction. Builder’s risk insurance policies are specialized property insurance policies for construction projects. Make sure the policy does not exclude hurricanes. In other words, you do not want hurricanes to be an excluded peril, particularly if there is the chance your work will take place during the hurricane season and/or you are performing work where storm surge or flooding caused by a hurricane can be an issue. If there is a sub-limit for hurricane-caused damage, know what that sub-limit is. You want to know a) what property and materials will be covered for hurricane-caused damage, b) whether costs to protect the property and materials from the hurricane are covered, c) whether the policy covers repair costs, and 3) whether the policy covers delay-type damage caused by the hurricane. Get a copy of the builder’s risk policy in advance. This way you know whether or not you need to supplement the policy accordingly or, alternatively, you want specific perils covered before that policy is bound. In fact, you will likely want to supplement this with a construction equipment / inland marine insurance policy. Work with an insurance broker that has experience with construction projects to ensure you have the right insurance in place for the project and your business. 2) Make sure your contract specifically identifies a named storm such as a hurricane as a force majeure event. Make sure your contract specifically identifies a hurricane as a force majeure event. Be specific. A hurricane should be an event that entitles you to additional time to perform since time will be spent protecting the work and tying down equipment and materials, time will be spent dealing with the actual hurricane, and time will be spent assessing the damage, remediating the damage, and ramping back up. 3) Make sure your contact entitles you to delay-related compensation associated with a hurricane such as a force majeure event. A time extension for a hurricane is a given. But, what about compensation for the impact? Your project schedule is not going to include the risk of a hurricane, as there is no reasonable way to include that time in a project schedule. Hence, the time extension. As we know though, time is money. You want to include a provision that entitles you to compensation for the time impact. The provision should entitle you to utilize contingency money for any delay or, perhaps more appropriately, entitle you to a change order for the time-related costs. (I have even drafted provisions that include a specific force majeure contingency to address associated costs for a force majeure event.) You can even stipulate to a daily rate for such time-impact costs (which I have also done) caused by a hurricane or force majeure event. A hurricane will not only prevent you from performing, but it will shift your performance to essential activities (that will not be included in your schedule). It is reasonable for impact-related costs to be recoverable for such a force majeure issue. It is unreasonable for the risk to be entirely shifted to the contractor because Mother Nature is certainly a risk that a contractor cannot control. 4) Make sure your contract entitles you to recover costs associated with preserving and protecting work in-place, materials, and equipment. As mentioned, a hurricane will divert your performance to progressing the work to preserving and protecting work in-place, materials, and equipment. All of this needs to be protected from prolonged, heavy wind activity, torrential rain, and potential surge and flooding. There are costs associated with this and you want to make sure this is performed to minimize the likelihood of any loss. You also want to make sure you have time to perform this work. Be safe, rather than sorry, and do not wait to the last minute to see what direction the hurricane ultimately pursues. Hurricanes, as we know, are unpredictable and take unpredictable paths. We need to make sure we have time to not only preserve and protect the work, materials, and equipment, but that our employees and subcontractors (and their families) safely make the right decisions to protect their homes and families. Similar to the above, make sure your contract specifies how you get paid for this type of work – whether through contingency funds or, perhaps more appropriately, a change order. Notifying the owner in writing in advance of the protective measures being performed is always a good idea. If the owner elects not to implement such measures because it does not want to bear the cost, then the owner is evidently bearing risk. 5) Know your contractual notification requirements. Your contract probably includes notification provisions to address time impacts and costs associated with protecting the work. Make sure these provisions are reasonable in light of a hurricane or force majeure event. Your priorities when dealing with a hurricane, in particular, will be shifted. For this reason, you want to make sure the notification provisions are not unreasonably onerous and are more than reasonable to account for the issues you will be dealing with. Think these issues through. Remember, not only will you be dealing with the issues associated with the construction project, but there will be internal issues dealing with the safety of your employees, their families, and any subcontractors you hire. Do not panic if your contract currently does not, in your opinion, sufficiently address all of these items. You can address this moving forward. You should address this moving forward. Again, no excuses. And, again, do not be reluctant to hire a construction attorney that can best protect your rights moving forward to account for this risk that we know is REAL.